Whether you are on a short vacation, hiking in Nepal or taking a year-gap, you must take care of your most precious belongings. That means keeping your passport, credit cards and money in a safe place. Your passport is without a doubt the most important document you carry when traveling; if you run out of money or get robbed, you can still borrow some money from a friend, but if you lose your passport, your vacation might be ruined … and you don’t want to spend those days in an embassy, right? A passport holder or travel wallet, depending on what you like to call it, will be very helpful because you can keep everything in one place. You won’t spend more time looking for your boarding pass, hotel keys, credit cards and important documents. That’s why passport holders have become so popular among travelers: they make your life easier. Passport covers come in different materials, designs and sizes. Some of them are made of high-quality leather while others are not as fancy but have many pockets and other features. You should choose the one that best fits your needs. Check out other buyer’s guides to find the best sling bags, travel coffee makers and luggage locks. You can find many models and sizes, designs and materials. They usually work as a case in which you can keep your documents, credit cards, etc. The only difference is that they tend to have more pockets, slots and storage, so you can keep the passports of your kids and partner, too. Did you know that American passports and those from many other countries are equipped with RFID, which means Radio Frequency Identification? Yes, the chip stores information about you that the authorities can read. With a proper reader, some criminals can read that information too, as long as they get fairly close. RFID blocking passport holders prevent anyone from reading your passport. They are built with metal linings that cut the radio frequency, keeping your passport safe. You probably know about the “find my phone app”, right? Some passport holders work in the same way, with a mobile application that allows you to trace the location of your passport. You can keep everything in one place, so you don’t lose anything. The best way to protect your documents from harsh weather conditions. Easy to reach and find documents. Think about your next trip. Are you going by yourself? Traveling with the family? Are you bringing many documents? There are hundreds of models of passport holders with different features and designs. Some of them are expensive while other are quite affordable. Prices generally start at as little as $10 and go up to $200, depending on the quality, materials, radio protection systems, available apps, etc. I’ve taken the time to compare many reviews to create this complete list, so you can make the right choice. 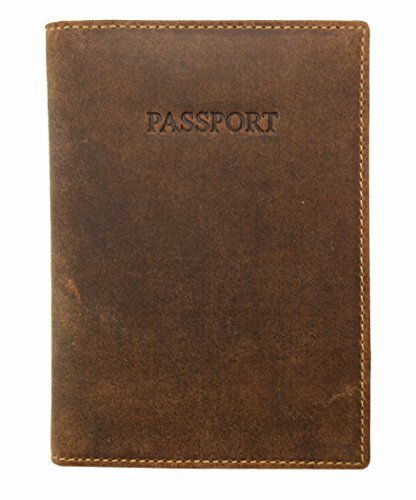 The following passport covers have been reviewed by many customers and have received very good feedback. The Fjallraven is a fantastic passport holder that fits pretty much all you need in it while maintaining a thin shape. It’s roomy enough to keep your passport, credit cards, driver’s license, scuba certification, boarding passes and many other things. It has a stylish and sturdy design, perfect for travel or daily use. It’s made of G-1000 canvas fabric, which is tough and durable. Fjallraven created this material using a combination of 65% polyester and 35% high-quality, all treated with Greenland Wax. As result, you get a water-resistant, UV-protected, breathable wallet. It has a main zip that opens the wallet and another interior zip in one of the storage pockets so you can keep coins. Like many other buyers, I find the Fjallraven to be one of the best options on the list. The Zerogrid offers great protection for your documents. The wallet is built with the DFID system, protecting your passport from identity theft. The Zerogrid is made of lightweight, water-resistant nylon. It’s breathable and soft, so you can use it underwear without problems. You will find plenty of pockets in a flexible storage system. There are three zippered compartments to store cash, credit cards and other valuables. 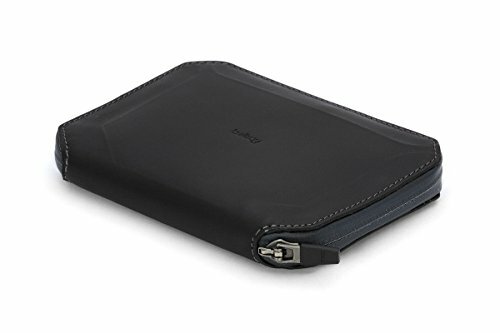 The Bellroy is a top-end wallet made of high-quality leather in a sophisticated and elegant style. I really like this one, even though it’s the most expensive wallet on the list. It features a water-resistant zip to keep all your valuables protected in the hardest conditions. It comes with a helpful pen and several compartments, including a slot for your passport and other pockets to keep your credit cards, boarding pass, multiple currencies and even smartphone. The pen might come in handy for filling out customs forms and in other situations. Overall, it’s a great wallet with plenty of room and top-quality materials. If you’re willing to spend some money. Herschel Supply Co. has a wide variety of quality products. I like the Raynor wallet because it’s simple, functional, well-designed and beautiful. You can find it in one color for a very affordable price. There are other colorful options but, in my opinion, the price increases too much for a little decoration. The model I’m reviewing here is made of 100% polyester. You’ll find a nice red and white striped lining in the interior, three slots for credit cards and a passport sleeve. If you like leather, we have good news: You can find the same model in high-quality leather and different colors. 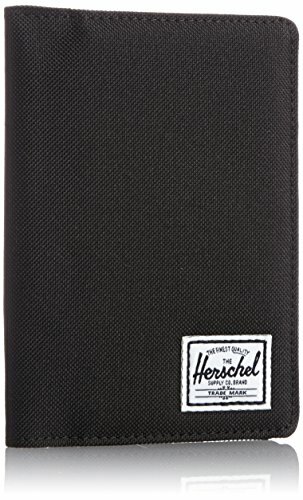 The Herschel Supply Raynor is a stylish and practical wallet for travel or daily use. The only downside is that there’s no zipper to close the case – either internal zipped pockets to keep coins. 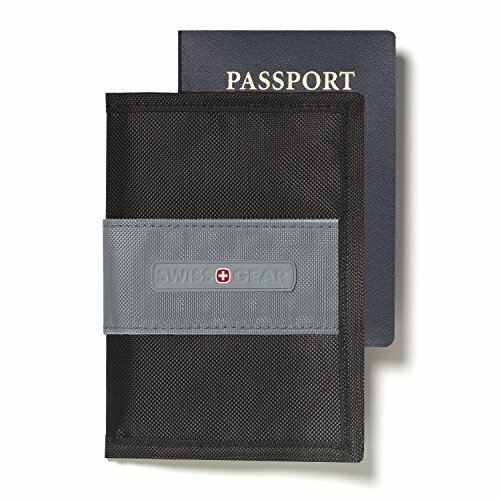 The Victorinox RFID holder is another great choice for any kind of travel. It’s simple and elegant and it’s equipped with the RFID system to prevent any criminal from stealing your data. This model can’t be zippered shut but it comes with an elastic closure which works just fine. There are just a few slots for your cards and a sleeve for the passport, so it’s not recommended for those who want to fill it with many things. This wallet is meant to be practical and efficient, not to carry your iPhone and other things. Overall, I like the quality and functional design. Keeping things simple helps to keep everything organized. If you are looking for more capacity, keep reading and check out the next wallet. I guess everybody knows Samsonite, as the company has been making quality suitcases and other products for decades. 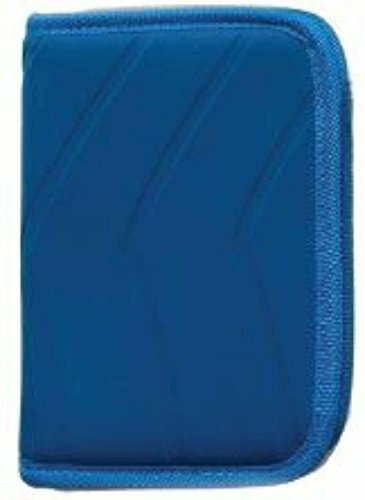 The Samsonite zip close travel wallet is a great option for those who need extra space. Even though it’s bigger than other wallets I’ve recommended, it still has a reasonable size and is very lightweight and soft. I like the external pocket for easy and quick access to boarding passes, maps and other things you must have on hand. In the interior, you’ll find enough storage to keep more than one passport, credit cards, maps, license cards and even your phone. There is a zipper to shut the wallet and keep all your valuables safe. I think it might be a good option for family travel. Some reviewers kept as many as six passports inside, along with other documents. The Visconti Hunter 732 is an elegant, well-designed wallet for short- and long-term travel. It’s made of soft, distressed leather (both the exterior and the interior) and has four credit card slots, one side sleeve and one top sleeve. It might be short in storage for some, but I think it’s enough to keep the most important valuables together with no problem. There is no zipper to keep it closed and it’s equipped with the RFID system to prevent criminals from stealing personal information. The wallet is quite elegant, so it might add some style and glamour to your backpacking trips. I think it’s one of the most beautiful choices on the list. 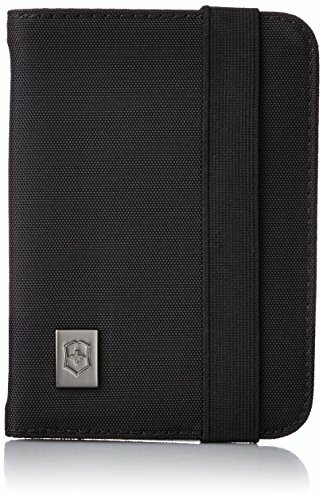 The Swiss Gear RFID is a resistant, tactical-style nylon wallet designed to protect all your documents from pickpockets, electronic theft and physical damage. The wallet is meant to last for years thanks to its rugged construction from high-quality nylon. It’s simple and easy to use, and it comes with a see-through mesh window for your passport, which makes it easier to check immediately. There’s not much storage in this simple design and the size is a bit tight, even though there’s room to keep your passport and some credit cards inside. The Travelambo is another simple, affordable and efficient travel wallet. It’s not big but there’s room for all your important documents. 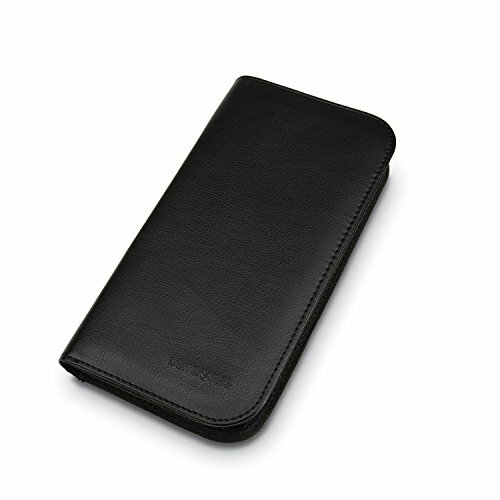 It’s made of soft, strong leather, and it has a stylish design, an RFID blocking system to stop electronic theft and a button to close it and keep everything safe. It’s a very popular option and has received many positive reviews from customers. It’s probably the best value for the money. 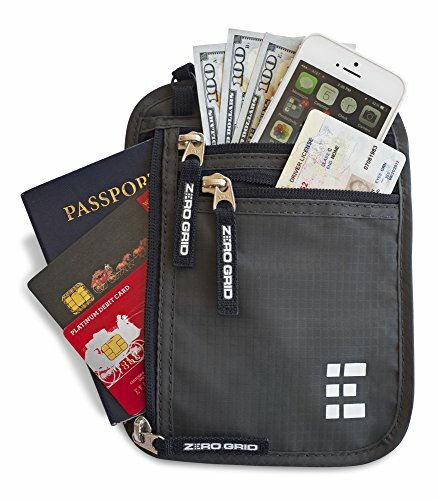 The ORB organizer is a great wallet to bring on your family trips. The interior looks well-organized and roomy. It has different compartments to hold as many as four passports, another compartment for travel documents and two compartments for credit cards. The exterior is made of soft neoprene with RFID metal linings to prevent electronic theft. A wrap-around zipper keeps all your valuables safe. 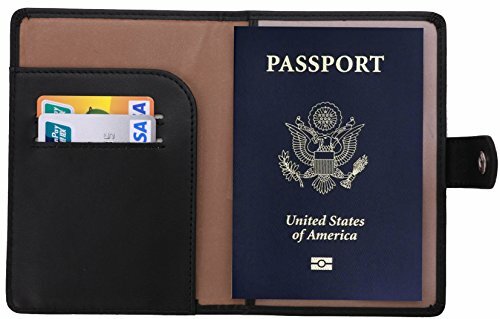 I recommend this wallet if you are traveling with your family and want to keep all the passports and important documents in one place. Keeping all your documents safe in one place is a great idea, but what about your electronic stuff? It’s quite messy to keep your batteries, SD cards, cables and other pieces scattered throughout the backpack, isn’t it? The Bagsmart travel electronic organizer will be very helpful for that purpose! It’s made of water-repellent nylon to keep all your accessories safe, while the double external zipper helps keep you from dropping anything while you take the organizer from your backpack. A storage plate separates the organizer into two parts and 17 elastic loops to store cables, chargers, batteries, etc. 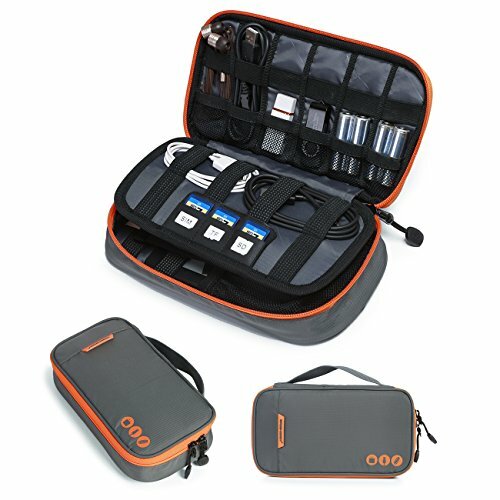 A good option for those, like me, who travel with a lot of electronic gear! 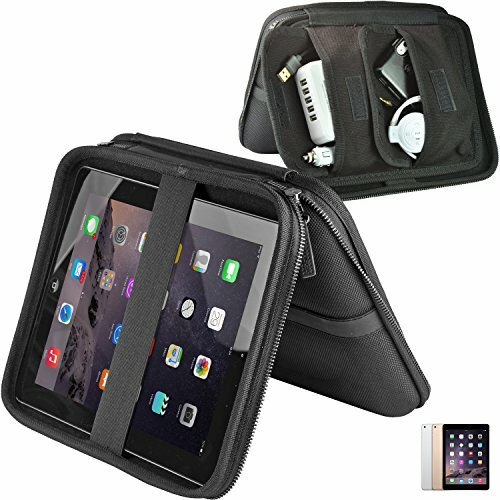 Alright, now that you have all your documents and electronic items organized, you might want to look at this great carrying case for iPads. The Mediabridge iPad Case will help you protect your iPad while traveling, keeping the iPad, cables and accessories in the same place. This really depends on how many documents you must bring. I recommend getting a passport holder in which you can fit all your stuff, but one that isn’t too big. A big holder can be bulky. Always save room for unexpected items but don’t get a giant cover. Keep in mind that some materials – like leather – last longer, while others – like plastic – resist harsh weather conditions better. Leather holders are durable and they look nice, but many people don’t want to buy an item that is made of an animal. It’s a personal decision. We’ve talked about materials, and this has much to do with durability, of course, but there are other things to consider when we talk about durability. Some low-quality products have bad seams that don’t last long. I recommend that you get a high-quality product, with a nice design, resistant materials and a good seam. 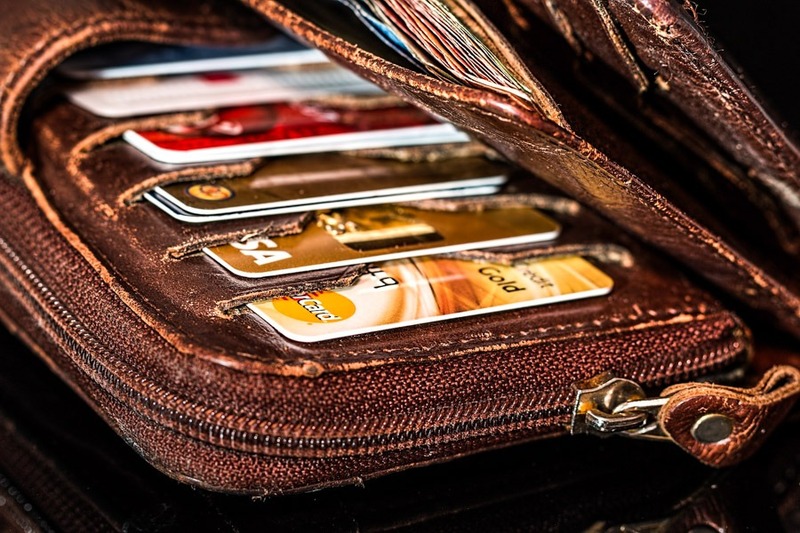 Many models come with internal or external zips so that the user can avoid dropping anything from inside the passport wallet. The most advanced passport holders are equipped with the latest technology that helps you find your passport if you have lost it or get robbed. These models are usually the most expensive. If you are traveling with expensive gear, you can get good insurance for those items. If you get robbed or lose something, the insurance company will get you a new product, depending on the coverage. Even though you are carrying all your important documents in a passport holder, it’s always a good idea to email yourself a copy. Sometimes you might get on a crowded bus or metro – a good opportunity for pickpockets to steal something. WHICH ARE THE BEST PASSPORT COVERS? 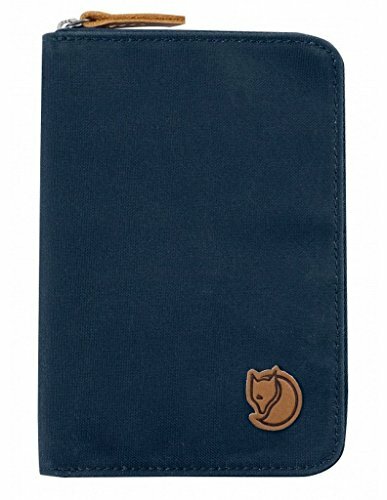 If you are looking for a practical, well-designed and resistant wallet, I recommend the Fjallraven for any kind of travel. If you are more into fashion and want a stylish wallet, go with the Herschell Supply Co. If you need a passport holder for your family vacations, choose the ORB travel organizer. Have you enjoyed the “Passport Holders for Travel, Review”? Leave a comment!